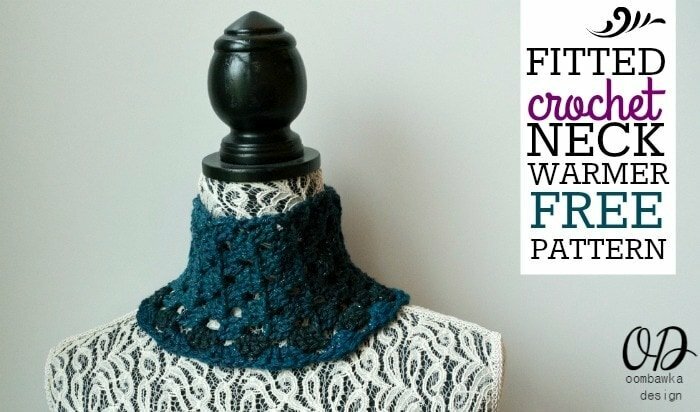 This is a very simple design – you can easily modify it and work it completely in double crochet stitches if you would prefer to have a solid neckwarmer. I have included these instructions at the very end of the post! 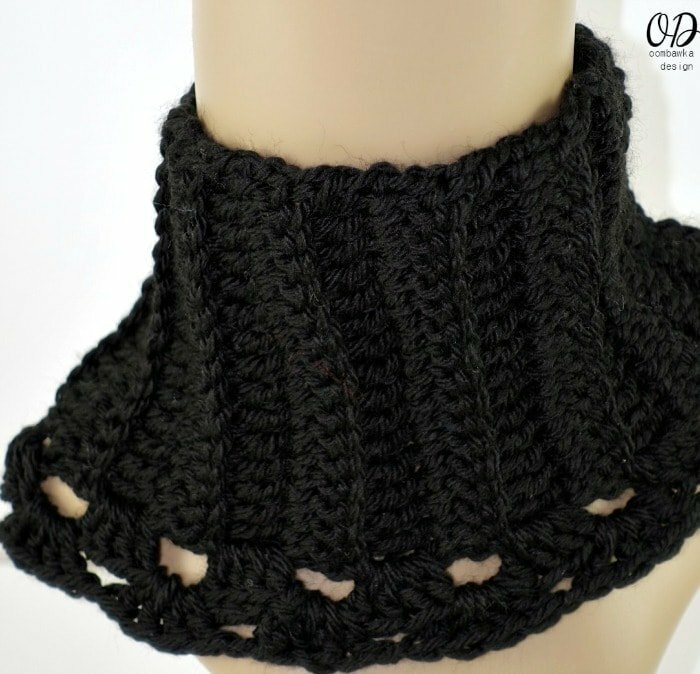 For those cool days when you do not want, or need a bulky scarf, or cowl this will be a great option. 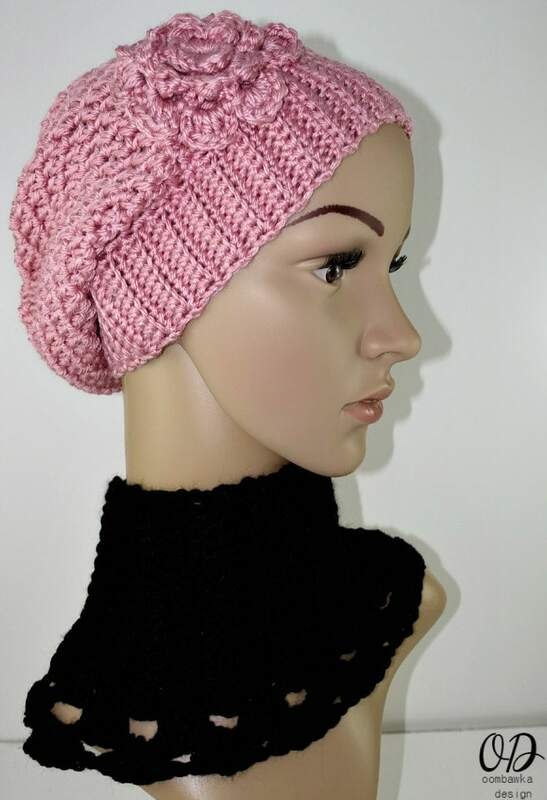 The size I have included full instructions for below will also work as a wide headband – it stretches to 22 inches which is the approximate head-size of the average adult woman. Alternate R2 and R3 until you have completed 26 rows in total. This will give you a neck warmer with a finished circumference of approximately 17 inches. It will stretch to approximately 22 inches if you are using the same yarn as I used – Red Heart Boutique Midnight. If you would like your neck warmer to be longer here are 2 other size options. Now join the ends from the beginning R1 and your final R26 (R32 or R37 if you used a longer option). I turned my project right sides facing inward and worked a joining row of slip stitches. You can alternately whipstitch those ends together if you prefer. Finish off and weave in ends. Turn your project right-side facing outward before continuing. Option: If you prefer to keep this completely adjustable you can choose to use a button closure instead of seaming the edge. I recommend moving up to at least 32 rows to accommodate for the buttons and the slight overlap you will need to close the piece. 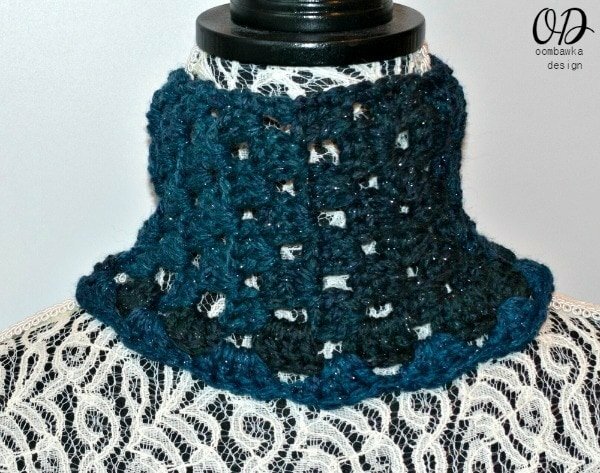 I edged the bottom edge only to widen the neck warmer to sit comfortably on the base of the neck and shoulders. NOTE: JOINING STITCH: Join your yarn with a standing double crochet in any space created by a ch 3 edge (basically if there is one dc, or a ch 3 alone on the edge join around it as though it were a ch1sp) I made them in pink font above so you know which ones I mean! If you don’t want to do a standing double crochet; slip stitch join and ch 2. R1: JOINING STITCH (see above note), work 3 additional dc stitches into this same space. Ch 1. *Sk the side edge of the next row (it will have block of 3 dc together there). Work 4 dc in the next space created by the ch 3 edge. ** Rep from * to ** around. Sl st to the top of the first joining double crochet. Work 1 sl st in each of the next 3 dc and once into the ch1sp. R2: Ch 3 and work 3 additional dc stitches into this same space. *Ch 1. Sk the next 4 dc. Work 4 dc in the next ch1sp.**. Rep from * to ** around. Ch 1. Sl st to the top of the ch 3 to join and finish off. NOTE: JOINING STITCH: Join your yarn with a standing double crochet in the space beside any of the dc stitches on the edge of the project. Essentially you will be working into the space between the side dc and the next dc in. R1: JOINING STITCH (see above note), work 3 additional dc stitches into this same space. Ch 1. *Sk the side edge of dc in the next row. Work 4 dc in the space beside the dc at the edge of the next row**. ** Rep from * to ** around. Sl st to the top of the first joining double crochet. Work 1 sl st in each of the next 3 dc and once into the ch1sp. Even though I usually don’t like things right on my neck I am going to try this because sometimes a scarf is too much. I think this would be good for wearing in the house in the winter instead of pulling a big bulky blanket up around your neck while watching tv.